As we seek to generate innovation in our businesses, it’s wise to consider how careful planning can foster an atmosphere where innovation takes place naturally. That type of plan was part of this country at its start. Opportunity: The Basis for Innovation in a Nation. When the United States was founded, its people were immigrants fleeing troubles such as famine, tyranny, and persecution. But the basic cause of their unrest with their mother countries was lack of opportunity. They, and their various state representatives, were adamant that the America would have opportunity written solidly into its founding documents. What was included in those carefully planned documents? The Declaration of Independence pointed out the problem. In it are listed over 20 actions taken by the king of England to quell self-government by the people in the American Colonies. They saw his actions as onerously limiting their opportunity in the important areas of their lives. The Constitution, written to avoid allowing the government to lapse into tyranny, specifically enumerated the powers ceded to the central (Federal) government by the people. It was carefully written to make sure that those in government didn’t begin taking over responsibilities not given to it. The Bill of Rights, five amendments added at the writing of the Constitution, before it was ratified, were intended to make absolutely certain that the powers in specific citizen areas (speech, arms, religion, press, and assembly) would be kept out of the hands of the Federal Government. As you are aware, this careful planning resulted in two centuries of innovative production that has been unmatched before or since. Let’s look at applying the same approach to a business. Building an Atmosphere of Opportunity in a Business. So, to begin with, what contributes to an atmosphere of opportunity – the basis for innovation? Freedom from fear. Whether in a nation or a business, it’s the absence of fear – fear of discouragement, of reprisals, of derision, of being ignored – that opens the floodgate of creativity and energy in people. If in your business you can effectively eliminate fear, you will have the foundation for amazing innovation and improvement. The opportunity to recognize a need. In order to bring their imaginations to bear on problems that need innovation, people need to know what’s going on. In a business, this means knowing the business’s goals and challenges. It means knowing how the business is doing, and understanding how what they do affects business performance. When staff know these things and are not fearful about recommending improvements, they begin putting real energy into making things better. The opportunity to do something about it. It’s not enough that people are able to recognize a need, there needs to be a way for them to actually do something about it. For the leader, this means taking the time to develop regular and acceptable means for a)innovations to be voiced, and b)those innovations to be put into place and tested. It’s really not very hard to do, and involves setting up a set of basic rules that folks will observe in their innovating. When these rules are the right ones, and are kept to a minimum, unbelievable things start to happen. Want to see an example? Take a look at the Ritz Carlton example. The opportunity for personal reward. I want the company to respect me as a person. I want to be recognized for the work I do. I want to be recognized for the contribution I make. I want to be heard, and my ideas considered. I want to improve the processes where I work, and I want my manager to listen to the suggestions I make. I want to work with other people who respect me and respect each other. I want to work with a winning team, one that has the respect of the company for its performance. I want to work in a company that’s respected by its customers and by the community. Interesting, huh? Developing a plan that produces people committed to world-class innovation is not rocket science, it can be done in any business – YOU can do it in your business. And what will those people give you as a result? Competitiveness, profits, loyal customers, lower costs, quick cycle times, high morale. Are these traits that you’d like to see in your organization? Take an hour this week to consider how these qualities in your people would help your company. Do it! How do you keep your company successful when the industry is changing? By innovating in your marketing methods and using existing production methods to advantage. The Shakers did both of these with farms during the height of the Industrial Revolution. The Shakers, or The United Society of Believers in Christ’s First and Second Appearing, began in England in the 1740’s but emigrated to the American Colonies in 1774. Formed by dissidents from both Quakers and Methodists in England, they were originally known as “Shaking Quakers”, an appellation shortened to Shakers over time. Our interest here will focus on their approach to business during the industrial revolution, and their ability to run a robust, farm-based economy when factories were the order of the day. The Shakers were masters in both production and marketing. In their processes, they implemented the Five S’s (see the article on page 1) about 150 years before it was codified by the Japanese. Both their shops and living quarters were notable for their orderliness and cleanliness, and for attention to necessity – if it wasn’t needed in the shop it wasn’t there. It was their sect that originated the saying “form follows function”, and while the lines of their furniture were beautiful, the number one object of all their designs was functionality. Archeologist David Starbuck, during 25 years of research at the Canterbury, New Hampshire Shaker Village, found that their industries there totaled four blacksmith shops, eighteen mills, and many craft shops, powered by a series of dams, spillways, and water wheels that made full use of the water flowing through the property. The group snaked the waterways around the property, taking advantage of the sloping terrain, to use and re-use water as it flowed down the hilly property. As far as the industries that the group ran to support their village, included were woodworking, wheel making, shoe making, weaving, spinning, sewing, and printing. They published catalogs of their goods that were eagerly sought throughout the United States, and the boxes for their garden seeds can still be found in antique shops across the country. Several of the Shaker villages have been restored and are run as museums, including that in Canterbury. This author visited Pleasant Hill, a Shaker village/museum in Kentucky, and marveled at the orderliness and functionality of the workshops, as well as the beauty of the items produced there. The pair of winding staircases in the main house must be seen to be believed. Another innovation used by this group in their industries was cross-training. Typically every member learned at least one other trade so that industries would not be lost by the death or sickness of a fellow. 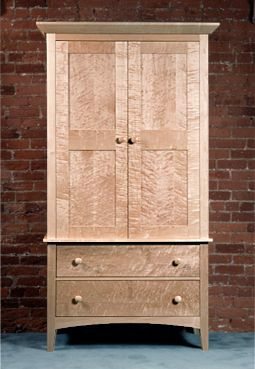 Shaker designs, even though several hundred years old, are still well known and very popular today, demonstrating the wisdom of tying two customer needs – functionality and beauty – to the production of furniture and other goods. How do you get an entire staff to come on board for world class innovation? Most of us would just give it up as too difficult to undertake. But the Ritz has it figured out, and their wildly enthusiastic return customers bear it out! Every Ritz Carlton employee is put through a careful orientation acquainting them with the customer-centered culture the company is known for. Every employee, along with the rest of the staff in his or her department, participates in a weekly meeting to review one of their ground rules and to come up with ideas to better apply it in their area. Every staff member and every department writes a Mission Statement that relates to them specifically, and sets the goal they have in achieving world class customer service. Every employee, from the housekeeper to the executive, can spend up to $2000 – no permission needed – to fix anything a customer is having a problem with. Now, they are required to write a report spelling out what they did to fix the problem, but there are no recriminations about the fact that they spent the money. Ritz Carlton has better than a 95% return business rate from its customers – and that’s with an average nightly room charge of over $200. Turnover at RC is under 25% annually, in an industry with an average turnover of over 125% (with hourly wages about the same). Customer “Wow!” stories abound, and staff are proud to be a part of a company which has won multiple Malcolm Baldrige and other quality and performance awards. A couple of businessmen were walking down a corridor on their way to the lobby of the hotel, and on their way passed a staff member mopping the floor. The staffer overheard one man telling his friend that he wasn’t happy with his room because of an issue with the bathtub. The staff member introduced himself, apologized for the problem, moved the man to fancier room on the Concierge Floor, and then went on to have the bathtub problem fixed. A couple were staying at a Florida Ritz Carlton for their 15th wedding anniversary, and in the course of visiting the hotel gift shop were talking with one another about the occasion. The clerk overheard them, and looking their names up on the register, had a bottle of champagne and glasses delivered to their room immediately afterward, with the compliments of the hotel. The hotel chain has pioneered a number of tactics based on employee suggestions that set it apart from even the best of their competitors. Housekeeping staff, when prepping a room for a new visitor, set the radio for a specific station. If the station has been changed when they clean, the new setting is noted, and subsequent visits by that customer will find the radio preset to that station upon their arrival. The hotel computer system also brings the customer’s name and room number up to any of the support staff who handle phone calls (front desk, kitchen, etc.). Customers are then always addressed by their proper name on any calls they make within the hotel. Finally, when you hear staff in a hotel or restaurant say to you “It would be my pleasure” – increasingly common today – remember that the phrase started with the Ritz-Carlton! Most of us think of ranching in the Old West with a feeling of nostalgia. But it was business as serious as any white collar company operating today. And teamwork within those ranches not only drastically affected profits, but could mean the difference between life and death. It was immediately after the Civil War that raising cattle hit its stride in the Old West, brought on by the demand for beef in the east and the large number of unbranded cattle running free in Texas and its neighboring states. During the war the agricultural economy of the country all but ground to a halt, and most of the cattle in the eastern states (both beef and milk cows) were butchered for food. People were clamoring for beef. At the same time wild longhorn cattle had increased to number about five million critters in Texas, and it became obvious that bringing this market and supply together would mean wealth for those who could do it. The western states were wide open at the time, not a strand of fence anywhere. In fact, most of the land was public land, and quite a few of the early entrepreneurs in cattle raising simply showed up before anyone else, settled in, and began running cattle on a select portion of “range” in that immediate area. Cattle from different ranches naturally intermingled over miles of range, and the challenge was sorting whose cattle were whose when it came time to think about going to market. The process of doing this was known as the roundup. Once a roundup date was set, the cowboys faced several weeks of uninterrupted toil – working from “can see to can’t see”. The first job was combing the hills and brush to bring the cattle into a central place – the actual roundup. Of course, this resulted in cattle from several ranches being gathered, and included branded stock, calves, and (especially at first) numbers of unbranded adult cows. Keep in mind that on many of these ranches it was not unusual for 3000 to 10,000 cattle to be handled during this time. Once the gather had been made, the real teamwork came into play. A ranch needed an accurate “tally” of the number of cattle in its possession. So during this part of the roundup each of the local ranches would send a tally man to represent its interests. 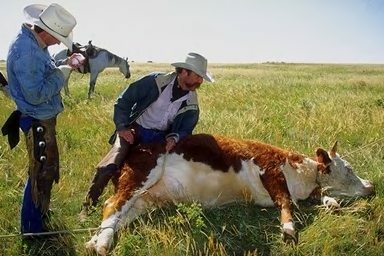 If the roundup was planned as a cooperative effort, other ranches would also bring hands to help with the identification and branding of the cattle. This was a dirty, dusty, and smelly business, and not without its dangers, either. The initial team task was separating – or cutting – the calves from their mothers, a process that didn’t go over well with either of the involved animals. The mother usually carried a brand, and her calf would naturally hang around her. The cowboy would identify the mother from her brand, and then he and his horse would team up to cut the calf loose from his mother. Horses trained for this job were called cutting horses, and would first cut off the cow and her calf from the main herd, and then keep the pair from getting back. 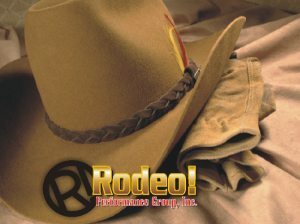 The cowboy, for his part, had to rope and (with the horse’s help) get the calf to the branding fire. There the calf was held down, branded, had his ears notched, and was otherwise marked for quick identification by anyone anywhere on the range. If the cowboy and the horse didn’t work well together, the cow would quickly rejoin the herd, and the whole job had to be done over again. The branding task was a team effort too, and a frantic one. Once the calf was down a hot iron was necessary to quickly apply the brand, and the “branders” relied on the “iron men” to provide hot irons from the fire. At the same time a cowboy with a sharp knife had to place the ear notches on the squirming, bawling calf; and if that weren’t enough, the smoke from the burning hair was enough make a man’s eyes smart and his nose to wrinkle. The work had to be done quickly, because there was usually an angry mother outside the fire trying to get to her calf, and willing to make things interesting for anyone who kept her away! Once branding and identification were done, the brander would yell “Tally!” with the name of the ranch, and that calf would be duly registered among the herd. These tallies were obviously critical to a ranch’s business success, because they allowed accurate financial planning (based on projected sales) and also gave the rancher the means for quickly detecting rustling should it occur. Cutting, tying, branding, earmarks – all completed in less than a minute, and done several hundred times a day during the roundup. Back then, if you didn’t work as a team, you were going to be on the job for a long, long time, and your ranch wasn’t going to be “the first with the most” when the all-important cattle drive – the money-generating part of ranching – started, with the aim of filling those eastern market orders. Those of us who lead businesses know that all the parts of the business lead up to producing the product – or service – our organization is valued for. It may seem that parts of the process don’t really “make money”, but that’s deceiving. The better the pieces of the process work, the higher the quality and the faster the production. A leader has to be a good coach for the team that makes up his or her business, because gold is hidden within those processes. Is your team working together to produce a high quality product quickly? Are you getting the cooperation and teamwork that’s concealed within your people? If you’d like to learn how you double or triple your team’s output even while raising quality, contact the author below. As you consider ways to encourage innovation within your organization, an historic firm worth paying attention to is the Colt Firearms Company. To say that their products – and organization – has stood the test of time is an understatement! The Colt .45 caliber handgun, the Peacemaker, is the oldest model handgun still in production in the world. Buy one today, and you’ll have the same pistol used by marshals, cowboys, and bad guys of the 1800’s. It was designed in 1872, put into production in 1873, and sold for $17 throughout the United States. Cowboys liked it because it could stop a 2,000 pound raging longhorn dead in his tracks. Marshals and outlaws liked it because it would fire six shots in a row without reloading, and do it accurately. It’s one of the most popular handguns ever invented, and Colt Firearms sold 370,000 of them between 1873 and 1941. It is often called “the gun that won the west”. The Colt company remains in business today, still producing its original .45, but continuing to innovate with modern weapons in common use by civilians, law officers, and the military. What do you do when you have a huge market clamoring for your product, but absolutely no way to get it to them? You look at your resources, evaluate your available staff, and come up with a whole new way to do things! Most folks don’t think about it, but the end of the war between the states – while it brought a sigh of relief to many – also revealed a huge deficit of food and materials, all of which had been decimated by the war. In the East during the war, people lost access to the cattle and produce raised in the South, and many had slaughtered even their dairy cattle to provide meat for their families. Provisioning the armies also cut deeply into beef supplies, and the end result was a huge demand for beef. In the West several situations developed producing surpluses of cattle but no market for them. California had cattle, and lots of them. But the lack of transportation meant that they were worthless except for their hides. Interestingly enough in his book Two Years Before the Mast, Richard Dana described the gathering of hides in California, and how ship’s captains would find ways to cram as many of the dried hides as they could into their vessels to bring around Cape Horn to the East Coast of the United States. But the meat from the skinned California cattle was left on the ground to rot or be eaten by birds and animals. There was simply too much to be reasonably used by the population in the West and no simple way to keep it from spoiling, either. In Texas, there were immense numbers of wild cattle – longhorns descended from cattle released when the Spanish had left the country. These were available free to anyone with the guts to go after them, and a handful of enterprising men settled into the area and began rounding up these animals. It was a daunting task. Longhorns had been wild for over 400 years and were huge, commonly averaging 1500 pounds with horn spreads of six feet or more. They were wild too, and frequently had ‘attitudes’ that kept the cowboys hired to catch them earning their monthly wages! In 1866 cattleman Charles Goodnight had a market for 2,000 cattle, but no way to get them there. The Civil War had been over for a year, and people in Colorado and Wyoming were clamoring for beef. He could pay $5 a head buying cattle n Texas and sell them for $35-45 a head if he could get them to the states on the west side of the Mississippi. Obviously, the profits from the drive meant a fortune in a time when the average cowhand was making $30 a month, but how to do it? After wrestling with the problem, Goodnight came up with the idea of a cattle drive, a workable solution in a time when there were no fences in the newly opening West. He had the cattle, he had the destination, he had the men to move them, but he needed a way to feed his hard working crew if he was to keep them content during the two dusty months and 1500 miles to get those cows to the railhead. Goodnight’s answer? The chuck wagon. Using a surplus Studebaker military wagon, he built a large, slanting box of drawers on the back to hold the flour, spices, coffee, utensils, and other necessaries his cook would need to prepare meals that would keep his cowboys on the job. Finally, he hired a good cook, stocked the wagon, organized the drive, and the rest is history. The Goodnight-Loving trail is still talked about as one of American business’s great ideas. The Cook Was on the Team too! When we think of a group of men wrestling steers weighing the better part of a ton, we don’t tend to think of the “cook” as part of that team. But he was, and an important one! Who’s Really the Top Money Guy? In a time when the average cowpuncher considered $40 a month a top wage, he wasn’t the top wage earner. Cooks in the old cow camps were more highly paid than the regular cowboys, and with good reason: a good cook would attract men from all over the territory, and was often the main incentive for them staying on the job. The cook was up well before dawn, getting the fire hot, mixing biscuits, making coffee, and generally beginning work three hours before anyone else cracked an eye open. His part of the team’s work, besides cooking, included gathering wood for cooking fires, keeping the outfit’s gear (it was stored in his chuck wagon), making sure there was always coffee on, day or night, and keeping the menu interesting. During the roundup males calves were usually castrated as part of the branding and identification work. Camp cooks would gather up the removed organs, roll them in flour and seasoning, and fry them or bake them in a Dutch oven. This dish became known as “mountain oysters”, and was a bona fide treat in the eyes of the western cowboy. You can imagine that “cutting” several thousand calves would provide quite of supply of this delicacy! Oh, and by the way, when the herd DID finally arrive at the new campsite, he was expected to have supper hot and ready. Down through our history innovation is one characteristic that has often set American business apart. This is well illustrated in the founding of the Pony Express, which, while it remained in business less than two years, demonstrated that a seemingly impossible task could be successfully accomplished with thought and vigor. St. Joseph, Missouri was famous in the mid-1800’s as the “jumping off place” for people going west. If you wanted to ride the stagecoach or if you were looking for an organized wagon train to hook up with, you started in St. Joseph. But the town was also the starting point for a well-known business venture known as the Pony Express. At the time of its founding there were no western railroads and no telegraph lines. If you wanted to get a message to the west coast and do it over land, your choice was the Butterfield Stage Company, and you could figure it would take 23-25 days to cover the 2795 miles between St. Joe and San Francisco. The Butterfield Stage had the official mail contract, but the looming Civil War meant that people wanted a faster way to communicate. Enter one of the owners of the stage line, William Russell, who convinced his two partners they could better meet customer requirements with single riders on fast horses carrying only a small saddlebag. Potential clients wanted speed and reliability, period. At the time the stage was the only game in town, and its 2800 mile route was intended to skirt around hostile Indians and obstructing snow, preserving its passengers lives (and hair), and incidentally getting the mail delivered. Russell’s new venture promised delivery in 10 days or less, charging $5 for letters weighing less a half-ounce, plus the normal 10 cent postage. 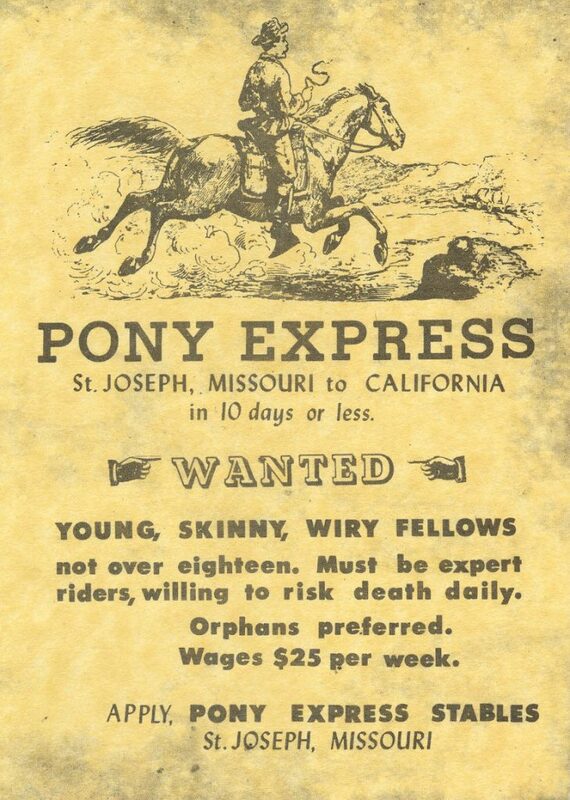 The Pony Express hired 80 small men from the hundreds who applied, the most famous of them William Cody, later known as Buffalo Bill. The business lasted only 19 months – until the telegraph was finished and provided much faster delivery of messages. During it’s short life Pony Express riders successfully delivered 34,743 pieces of mail, with only one mail delivery ever being lost. When considering strategies to retain good staff, it doesn’t hurt to look back at industries where the work was tough, but companies still managed to keep people on the job. The ranches of the late 1800’s were mighty good examples of this in their ability to retain good men on a tough job. The cowhand of 1875 was paid $30 a month plus room and board. He worked from “can see to can’t see” (pre-sunup to after sundown) in a job where his likelihood of violent death was a daily occurrence. On the cattle drives, about a dozen men would herd 3,000 cattle from the home ranch to the railhead for shipping – anywhere from 1000 to 2000 miles away. It was dusty, dirty, dangerous, and often had the added benefit of hostile Indians to make life interesting. How did the trail boss keep men on the job? One of the most important factors was hot coffee available all the time, and the coffee that was used universally in the west – to the point where some of the men didn’t know that other brands even existed – was Arbuckles’. Up through the Civil War coffee was sold green, in the form of whole When considering strategies to retain good staff, it doesn’t hurt to look back at industries where the work was tough, but companies still managed to keep people on the job. The ranches of the late 1800’s were mighty good examples of this in their ability to retain good men on a tough job. The cowhand of 1875 was paid $30 a month plus room and board. He worked from “can see to can’t see” (pre-sunup to after sundown) in a job where his likelihood of violent death was a daily occurrence. On the cattle drives, about a dozen men would herd 3,000 cattle from the home ranch to the railhead for shipping – anywhere from 1000 to 2000 miles away. It was dusty, dirty, dangerous, and often had the added benefit of hostile Indians to make life interesting. How did the trail boss keep men on the job? One of the most important factors was hot coffee available all the time, and the coffee that was used universally in the west – to the point where some of the men didn’t know that other brands even existed – was Arbuckles’. Up through the Civil War coffee was sold green, in the form of whole beans. To make it the cook had to roast the beans before grinding them, and apparently just one burned bean would ruin the whole batch. The Arbuckle Brothers of Philadelphia changed all that with a patented process of pre-roasting the beans and coating them with a mixture of egg and sugar that sealed the freshness of the roasted bean. They would then vacuum seal the beans into 1 or 5 pound packages, and ship them 100 pounds to the box. The coffee became so popular with the cooks and cowboys out west that the name “Arbuckles’” actually took the place of the term “coffee” when a man wanted the hot drink on a cold morning. One other “trick” the Arbuckle brothers used: every package of coffee included a stick of peppermint, and the busy camp cooks would use that peppermint to coax cowhands into grinding the coffee for them. 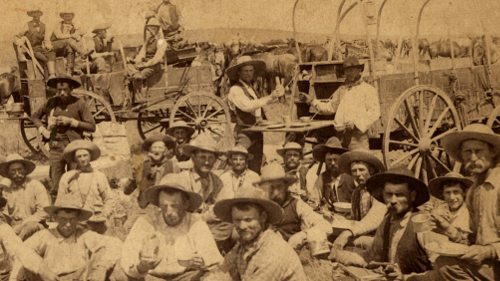 The cry, “Who wants the candy?” would bring even the toughest men to the chuck wagon to satisfy their sweet tooth by grinding another pound of Arbuckles for the trail crew. How has the Arbuckle Company done in providing a means for employers to keep good people on a tough job? They’re still in business today, and you can check out their site at www.arbucklecoffeetraders.com. 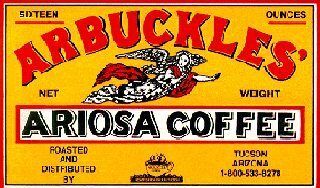 AND you can still buy the same Arbuckles’ Ariosa Coffee that the western cowboy knew 150 years ago. By the way, if ya want to brew up the same coffee that the cow camps used, the recipe is a handful of coffee for up to a cup of water, boil it until it’s blacker than midnight (some said a horseshoe ought to float in it…), and then settle the grounds with a sprinkling of cold water. Now, whether THAT recipe will be a favorite with your staff…? !